The Times tackles the Eternal Question, soliciting opinions on why, for women, impractical (and in cases, wildly impractical) shoes not merely persist but thrive. Of course, there are the sociological explications, the design perspective, the killjoy podiatrist listing a mind-numbing range of foot injuries. We all know the drill: to Greer, it's servitude. To Bradshaw, it's self-indulgence. To many, it's inexplicable. Fashionista versus frump, under all flags. make women appear to walk like helpless little girls who can't walk or run away ( i.e. make choices) from men...These women look like they need a man to carry them because they certainly can't circumnavigate the world on their own. Run for a cab in those? Teach class in those? Take the stairs in those? Fight for your client in those? And so the debate rages on: the sensible versus the defiant. Because there's no justifying heels; it's like smoking, only moderately less hazardous to those around you. And people wear them because they don't have to, in defiance of sense and economy. Now, we're primarily talking "fashion heels" here - although, come on, the McQueen shoes and their ilk are hardly representative any more than is a full-body lace suit sans undies. It's the runway. But it's still a valid question, and shoes have become absurd. Why do we wear heels? I can only tell you why I do: I'm short. They make me look taller. I went through most of my life looking up to people, with companions having to walk in the gutter. Then I realized I could wear a pair of shoes and look people in the eye. That simple, and I'm sorry but that's a good thing. Men don't have the pressure to torture their feet? They also don't have the option of increasing their height. Well, not without a hefty side of ridicule (and the time poor teenage uncle D bought elevator shoes still looms large in family lore.) But that said, I make no claims to moral superiority, and I'd add to this that wearing heels is like riding a bike: don't do it if you don't know how. It's dangerous and stupid-looking. It's like heavy makeup - you only notice it when it's bad. There are plenty of us striding around comfortably whom you don't notice because someone's teetering by further down the block. I'm not saying you should run in heels - ankles etc. etc. - but I can, most of us can. Of course, I choose my shoes with care - for walking, chunky heels and, whenever possible, good engineering like the estimable Faryl Robin's. 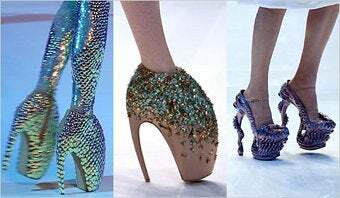 "Fashion heels", yes, but not just any! Sure, good ones are pricey, but it's not an area where you want to compromise, and if we're gonna come down hard on anything, surely it should be budget do-mes, with their lack of cushioning and flimsy heels! Caveat emptor, sisters. But for non-heelers: Don't like it? Don't do it. I understand that there's pressure still in some professional environments to don a heel (although surely fewer and fewer) but for most of us, it's a choice. Sometimes, in this world, we want to control our risks for a few hours. The further things move from necessity, the more closely they approach decadence and I suppose for the naysayers, Nero's fiddling as we blithely toss away the gains of our mother's generation. But there's something to be said for reclamation. And you know what? Some of us like the option of riding roller-coasters occasionally. Or, you know, appearing in surrealist operas.